BioCorneum®+ is the 1st and only quick drying silicone gel scar treatment with SFP30 cleared by the FDA. BioCorneum®+ is the choice of Dr. Alexander Gross when creating a comprehensive scar management plan for patients. Interesting Fact – BioCorneum®+ was the choice of Angelina Jolie’s surgeons for her post op scar management plan. BioCorneum®+ helps prevent abnormal scarring after surgery (cosmetic or medical); and also works for scarring from all types of burns. It soften and flattens raised scars, and prevents discoloration caused by sun-exposure by incorporating sun screen ingredients providing an SPF of 30. 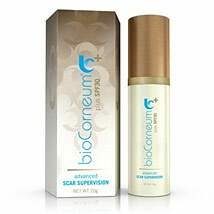 BioCorneum®+ reduces redness and discoloration, while relieving itching and discomfort associated with scar healing. It is water resistant, and may used on irregular surfaces as well as along large area scars.